Abstract: Our modern ability to acquire and generate huge amounts of data can potentially enable rapid progress in science and engineering, but we may not live up that promise if our ability to create data outstrips our ability to make sense of that data. Visual computing tools are essential to gain insights into data by combining computational and statistical analysis with the power of the human perceptual and cognitive system and enabling data exploration through interactive visualizations. In this talk I will present our work on visual computing in Connectomics, a new field in neuroscience that aims to apply biology and computer science to the grand challenge of determining the detailed neural circuitry of the brain. I will give an overview of the computational challenges and describe visual computing approaches that we developed to discover and analyze the brain’s neural network. The key to our methods is to keep the user in the loop, either for providing input to our fully-automatic reconstruction methods, or for validation and corrections of the reconstructed neural structures. The main challenges we face are how to analyze petabytes of image data in an efficient and scalable way, how to automatically reconstruct very large and dense neural circuits from nanoscale-resolution electron micrographs, and how to analyze the brain’s neural network once we have discovered it. 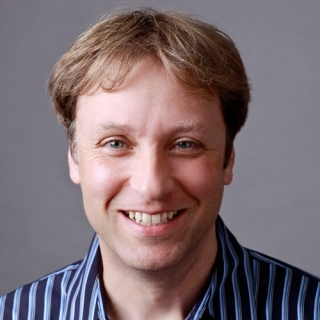 Speaker Bio: Hanspeter Pfister is An Wang Professor of Computer Science and Director of the Institute for Applied Computational Science at the Harvard School of Engineering and Applied Sciences. His research in visual computing lies at the intersection of visualization, computer graphics, and computer vision. It spans a wide range of topics, including bio-medical visualization, image and video analysis, 3D fabrication, and data science. Dr. Pfister has a Ph.D. in Computer Science from the State University of New York at Stony Brook and an M.S. in Electrical Engineering from ETH Zurich, Switzerland. Before joining Harvard he worked for over a decade at Mitsubishi Electric Research Laboratories where he was Associate Director and Senior Research Scientist. He was the chief architect of VolumePro, Mitsubishi Electric’s award-winning real-time volume rendering hardware for PCs. He is the recipient of the 2010 IEEE Visualization Technical Achievement award in recognition of his seminal technical achievements in real-time volume rendering. He is co-inventor of over 50 US patents and co-author on more than 120 peer-reviewed publications, including over 20 ACM SIGGRAPH papers, the premier forum in Computer Graphics. He was technical papers chair for SIGGRAPH 2012. He is co-editor of the first textbook on Point-Based Computer Graphics, published by Elsevier in 2007, and of the 2006 NIH/NSF Visualization Research Challenges Report. He received the IEEE Golden Core Award, the IEEE Meritorious Service Award, and the Petra T. Shattuck Excellence in Teaching Award. He is currently on the editorial board of the ACM Transaction on Graphics (TOG). You can contact him at pfister@seas.harvard.edu.